Depression is a common mental disorder that people all over the world suffer from. In fact, the World Health Organization reported in March 2018 that more than 300 million people of all ages suffer from it. There are various reasons for why people are depressed, but loneliness is one major cause. Jelyn (34), from the Philippines, is one of many who has suffered from depression. Besides from having a successful career as a civil engineer and running her own construction firm, she still felt miserable and discouraged. After having experienced family problems and a heartbreak, Jelyn found it difficult to get up in the morning and take on a new day. However, this started to change once she joined Travello. She is 34 years and a civil engineer who runs her own construction firm in the Philippines, where she is from. She loves to travel and plans on visiting the UK, Australia, USA and Canada next. In September 2018, Jelyn posted an emotional message on Travello, which appeared in the main newsfeed. The message reached thousands of people and created a lot of engagement. In the post, Jelyn bravely wrote about overcoming severe depression, thanks to the global community of people she found when she joined Travello. You can read her full post at the end. After posting, she has received plenty of messages from people all around the world, sending her encouraging messages as well as their own stories of depression. Travello reached out to Jelyn to understand how the app had helped her. Travello: Jelyn, you mentioned that joining Travello helped you overcome severe depression. Could you explain to us how it helped? Jelyn: For me, Travello plays a big part in my healing process. After losing the presence of a father and the man I thought was the right one, I felt alone and depressed. I lost my interest in everything and shut the world out. Until one day, while browsing the net I saw the Travello app and downloaded it. I decided to join Travello because I want to share my travel experience and at the same time to meet new people. The first picture I posted got a number of likes so I felt appreciated and some even sent messages and became my friends. I opened up to them about myself and what I was going through. And surprisingly, these people helped me and gave me encouraging words. I am very thankful that the people I met became part of my healing process. 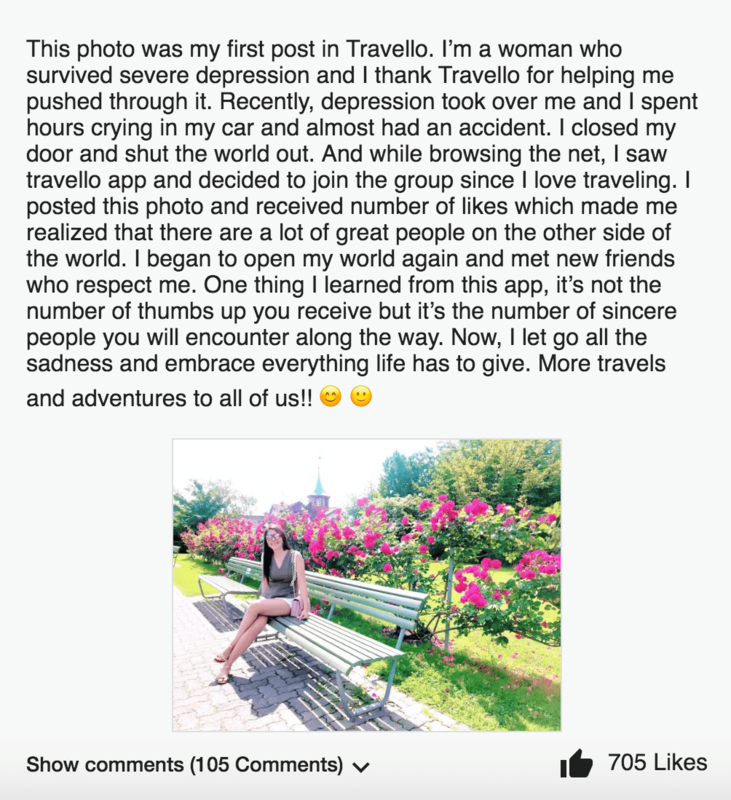 Travello: You posted an emotional post on Travello that thousands of users around the world could see. Why did you decide to do this? Jelyn: The reason why I decided to share how I overcame my depression, is to help and encourage others who are in the same shoes as I am. We all know that depression is really a serious thing and can even lead to a suicidal stage. So, as a survivor, I decided to share this and be able to enlighten those who are experiencing it and help them realize that everything happens for a reason. That we must focus on other things that can make us a better individual. Life is wonderful after all. Travello: What has happened after sharing your experience with the Travello community? Jelyn: After I posted about my depression, I received a lot of messages from Travello members and some even shared their own encounters with depression. There is also one woman who is suffering from cancer who felt blessed of what I posted. 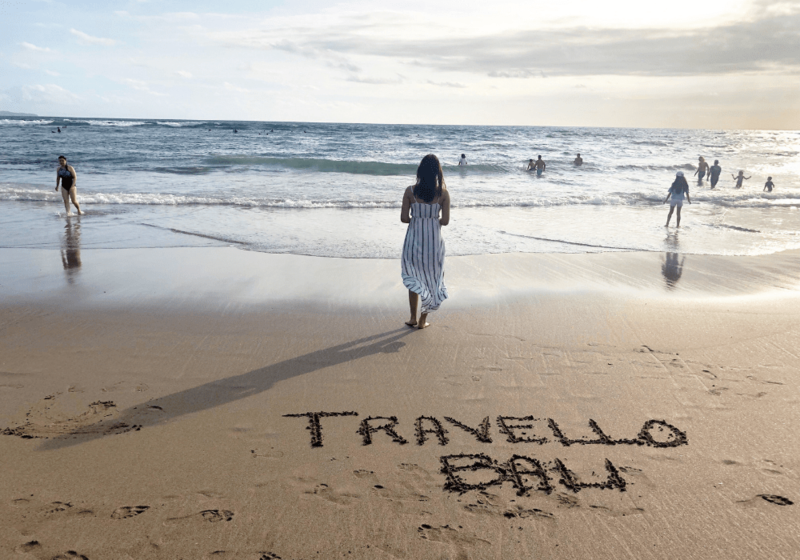 Travello: How do you believe that travel can help with depression? Jelyn: As a person who loves traveling, a solo or group trip is one way to overcome depression. It is in travel that we learn to appreciate every little thing that we have. Travel allows us to become the person who we really are. It helps us to communicate and deal with people. We learn to value the importance of humanity and humility. Travello: Would you recommend other people with depression to join the Travello community? Jelyn: Yes. I would recommend the Travello app to people, especially to those who love to travel. It’s a good app to share travel experiences and to meet new people. Travel does not need be expensive or luxurious. With the Travello app, people are able to connect, attend and set up meetups in order to meet with other travellers around the world. It also shows other Travello users who are nearby and what country they’re from. Travello users will therefore always find fellow travellers on their trips to connect with, either in person or by messaging in the app itself. Want to join the world’s largest travel community on app? Download Travello on iOS or Android for free! 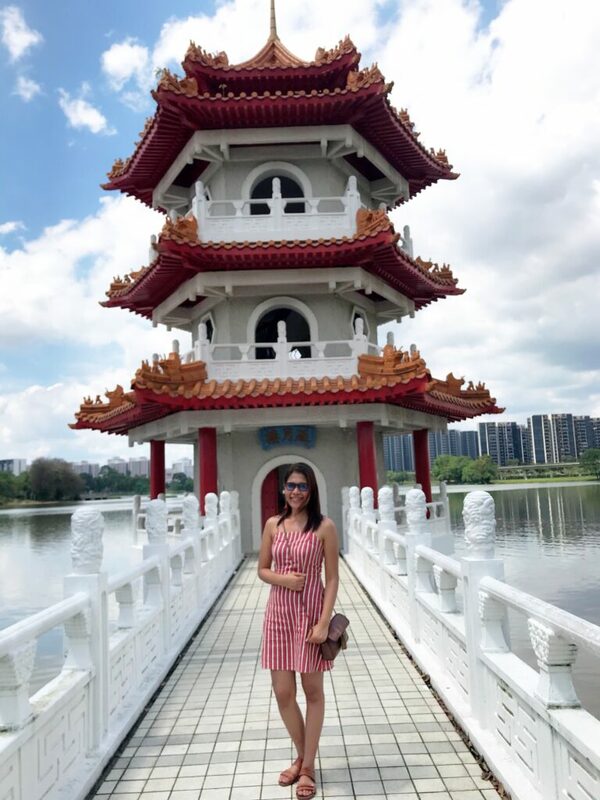 Follow Jelyn and her travels on the Travello app here!